Exclusive first look at The Manor show home! The new show home at The Manor is 4 bed detached home, the Hertford. Have you ever found yourself thinking there’s no place like home? Evenings in front of the TV with your loved ones, long, relaxing bubble baths, sounds like heaven right? Award winning house builder Peter Ward Homes is all about comfort and contentment when it comes to designing houses and tick off all the requirements needed to fulfil the perfect family home. 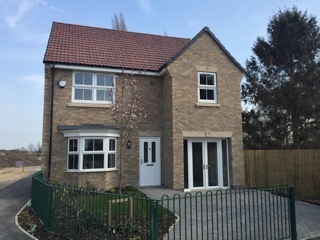 To add to the excitement of the Open Weekend at The Manor in Gilberdyke on Saturday 18th and Sunday 19th April , a new show home will be up and running for buyers to get a real insight into a Peter Ward Home. The house up for show is the Hertford, a four bedroomed detached house with integral garage, perfect for large and expanding families or those looking to move up or down the property ladder. Our show houses are designed to help buyers really visualise living in one of our homes. It’s not until you actually get a taste of what we offer, that you realise a Peter Ward home is a home for life. The Hertford is just one of many Peter Ward homes that is designed for spacious living. With a generous lounge and expansive kitchen/day room, there is plenty of room for nights in with the whole family. As well as this the kitchen includes the stylish bi-folding doors, a feature designed to bring the outside inside. In addition to the tour of the show home, Peter Ward Homes is giving buyers the chance to own up to £1500 worth of extra’s under the company’s new Personal Touches scheme. (Available on selected plots only) As well as this anybody reserving a plot, or doing so before the 31st August 2015, will get a free stylish lighting package worth up to £1600. And it doesn’t end there, one lucky individual could be the new owner of a 64GB iPad Air in a free prize draw. So if you’re looking to purchase a new house, come along to the Open Weekend in April from 10am-5pm where the on site sales team and independent financial advisor will be on hand to help you secure your perfect family home. Next Post → Another Successful Open Weekend!